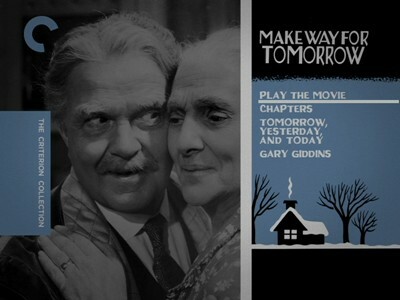 The 1937 film Make Way for Tomorrow is the story of Ma and Pa Cooper, an elderly couple who have been together for fifty years. They now find themselves as victims of their time, and Leo McCarey's sweet drama is also very much a product of that time. It reflects the economic state of the world the Coopers had aged into. Its title has an ironic double meaning: it's a hopeful looking ahead at change, but it can also be barked out like an order, telling the older people to get out of the way. Nowhere in the movie is this more sharply felt than when Ma and Pa step out on the dancefloor to waltz, only for the music to change to something faster they can't step to. 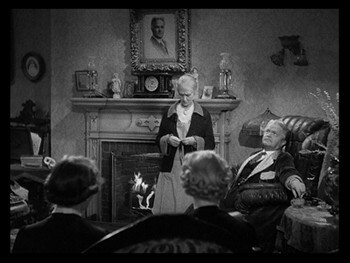 Barkley Cooper (Victor Moore) and his wife Lucy (Beulah Bondi) had five children together, and they summon the four of them that still live nearby to their childhood home to tell them that the bank is foreclosing on the house. Though they were given six months to vacate, they've waited until the last minute to tell anyone. 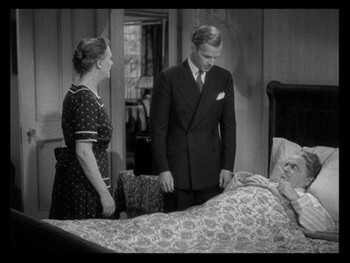 The good son, George (Thomas Mitchell), realizes that any plans that can be made on the fly won't be ideal, they will have to split the old folks up. He will take his mother to live with his family, a three-hour drive, and his sister, the cold shrew Cora (Elisabeth Risdon), will put up their father. The plan is for the other sister, Nellie (Minna Gombell), to reunite both parents at her home in three months, something her husband (Porter Hall) quickly puts the kibosh on. Living apart is hard on both the parents and the children. Ma is in the way in George's apartment, having to share a room with their teenaged daughter Rhoda (Barbara Read) and encroaching on how George's wife Anita (Fay Bainter) runs her household. Pa gets sick while out looking for a job, and he doesn't much like Cora's care any more than she likes giving it. Something else is going to have to be done. Make Way for Tomorrow is a much beloved film. The DVD has testimonies from filmmakers Peter Bogdanovich and Bertrand Tavernier. Roger Ebert recently wrote about it in his Great Movies column, noting how much heart it had and how tough it was. He rightly points out that were this a movie made today, there is no way it wouldn't get stuck with a clichéd happy ending. To be honest, though, for the first 2/3 of the film, I couldn't see what all the fuss was about. I didn't dislike it, it was charming in a quaint kind of way. It moved at a slow amble, and people spoke pleasantly to one another even if the subtext was harsh. Everything about the movie was just so damned reasonable. Sure, the kids were begrudging in their charity and maybe didn't come up with the best plans for helping Ma and Pa out; at the same time, the old folks are kind of annoying. It's only in the third act that everything starts to make sense, when we see at last why everyone is so brittle. Cora decides to use her father's chest cold as an excuse to ship him off to sunnier climes. He'll stay with the absent sister out in California. 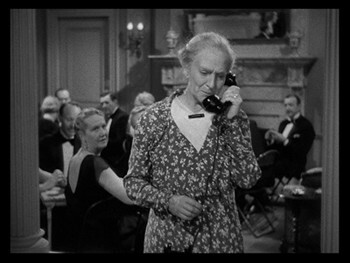 Knowing she can't go with him, Ma nobly makes a plan to check into an old folk's home, but only on the condition that her husband not be told. George accepts, but he feels like a heel doing it. On the day when Pa is meant to leave, he and Cora meet in New York City for a few final hours together. They are on their own, free of their children, and they start to reminisce. Fifty years prior they had come to New York on their honeymoon. Could maybe some of the old places they visited still be there? Once the Coopers are back together, Make Way for Tomorrow takes a lovely turn. The spark that has been lacking in the earlier part of the movie was intentionally left out. It's because there is no spark when Ma and Pa are apart. Together, though, oh! What charming people! They are still romantic, still impressed with what makes the other one tick, and comfortable in the way they get along together. It's not just the audience that sees how wonderful their love is, but all of New York City. An oily car salesman gives them a ride, but he has no ill will when he discovers they are broke. The old hotel they stayed at as newlyweds rolls out the red carpet when they hear that guests of such a distinguished age have returned. All the things about this wonderful pair that their offspring could not see are obvious to everyone else. You'd have to be a pretty tough customer not to have tears in your eyes when the bandleader sees that Ma and Pa are lost in his up-tempo rhythms. The part I didn't tell you up above is that he stops the faster number and goes back to a waltz to give these aged lovers more time to enjoy each other's company. As mawkish as this all may sound, Make Way for Tomorrow stays far away from obvious melodramatic tugs or soppy sentiment. Leo McCarey, working from a screenplay by Viña Delmar (The Awful Truth), who sourced it from a novel and a play, put their faith in the material and in their audience to understand that fifty years of personal history is a long time. It would be easy to mine their story for the easy emotional peaks, but personalities are so much more interesting than plot. Of course, it helps when you have actors as insightful and empathetic as Victor Moore and Beulah Bondi. Moore had been acting in movies since 1915, and Bondi was playing a part well ahead of her years; she would act well into the 1970s, and is maybe best known as Ma Bailey in It's a Wonderful Life. Both actors pull way back for their performances here, giving themselves over to the effects of aging, moving slow, speaking softly, but never slipping into caricature. How fun it is to see Ma Cooper eventually cut loose and have a couple drinks! Make Way for Tomorrow is a portrait of America as it was still finding its way out of the Depression. On one side, the Cooper children are doing all right and finding prosperity again, but on the other is their parents, part of an older generation that never quite found their way back to the way things were. Part of the kindness the old people find in New York is likely down to people having sympathy for them and also being impressed that they have survived this long. 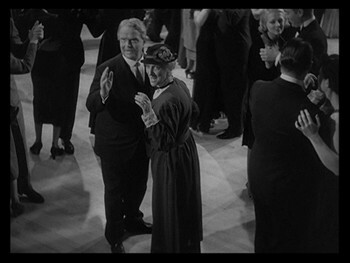 Leo McCarey avoids visual flash in the same way his actors avoid histrionic displays of emotion. These are dark times he is depicting, and though he isn't exactly predicting the Italian Neorealists, he does try to show the world as it was and not how Hollywood dreamed it to be. He also avoids copping out at the ending. A cheerful conclusion would have seemed hollow when there were no easy answers waiting for any moviegoers outside the theatre. It's just like how Jason Reitman left us hanging at the end of Up in the Air, one of the few movies to portray the financial hardships of contemporary times. To say it's all going to be okay would be disingenuous. It would also probably relegate both movies to the scrap heap. Had Make Way for Tomorrow ended with money raining from the sky, I doubt we'd be talking about it today, much less watching it in a Criterion edition. Hell, this movie even makes fun of those kind of movies, the way Ma Cooper describes the predictable genre picture she saw with her granddaughter. Honesty is what resonates through the ages, what makes a story timeless and universal. 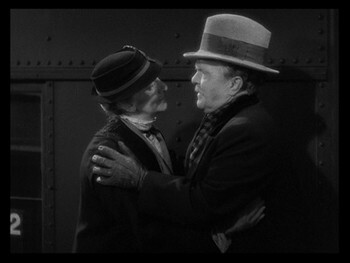 I find Leo McCarey's film more hopeful because it shows us two people who can make the best of the worst times, who are resolute, and who never let go of what matters, even if they have to say goodbye to it. Criterion gives us Make Way for Tomorrow at a full frame 1.33:1 aspect ratio, pictureboxed for square televisions. The image quality is pretty good. The print shows some wear, but it has mostly been cleaned up. The picture is maybe occasionally a little lighter than intended, it seemed at times to be more grey-and-white than black-and-white. These nitpicks are understandable, though, and acceptable. The overall quality is very good. The original soundtrack is mixed in mono with only a little hiss, no distortion. Subtitles for the Deaf and Hearing Impaired are available. Make Way for Tomorrow is packaged in a clear plastic case with a double-sided cover. It has a thick interior booklet with photos, credits, chapter listings, new essays by critic Tag Gallagher and Bertrand Tavernier, and an excerpt from a 1998 article on Leo McCarey by author Robin Wood. The best part about the packaging, though, is it has multiple new illustrations by one of my favorite cartoonists, Seth. His comic book It's a Good Life if You Don't Weaken is all about nostalgia for things lost, and recent projects like Clyde Fans and George Sprott deal with the effects of age and reconciling the life one has lived. This makes him a perfect choice to capture the charm and emotional beauty of Make Way for Tomorrow. Peter Bogdanovich appears on the disc itself as a commentator. The director and historian talks about Leo McCarey in the program Tomorrow, Yesterday, and Today. At 19 minutes and 50 seconds, it only takes him thirty seconds to mention Orson Welles--but he's got some great stories about McCarey and gives some good info on Make Way for Tomorrow. 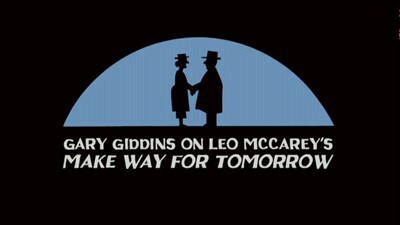 There is also a new interview with critic Gary Giddins (also about 20 minutes), focusing especially on McCarey's position in life at the time of the movie, and how his biography influenced the film as well as how the political climate of 1937 influenced it. He also discusses the reaction to the film. 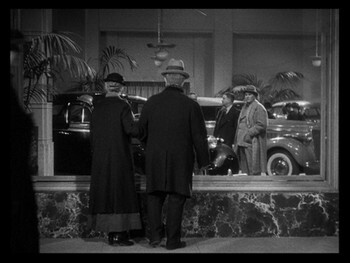 Both extras also look at where McCarey went from here, including his run-ins with HUAC and what his real leanings were. Highly Recommended. 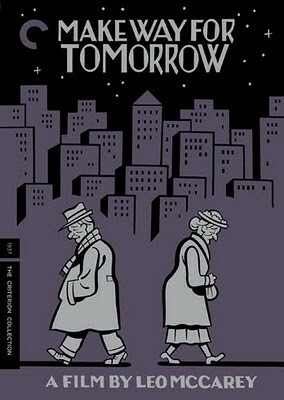 With Make Way for Tomorrow, Criterion has dug up another gem that was nearly forgotten. This touching tale of a love that has survived the years and is hitting hard times in the Great Depression shows a healthy respect for old age and the endurance it takes to get there. Director Leo McCarey's story of a married couple of fifty years who have lost their family home and find themselves adrift is tough with its characters, honest about their motivations, and finds the true heart of the experience it portrays. Be prepared to get a little weepy.